While visiting the Mt. Cuba Center this past weekend I was treated to a variety of fall wildflowers with fall colors right around the corner. The gardeners there do such an amazing job, and they've introduced a number of cultivars over the years that I find well worth the effort in tracking down. 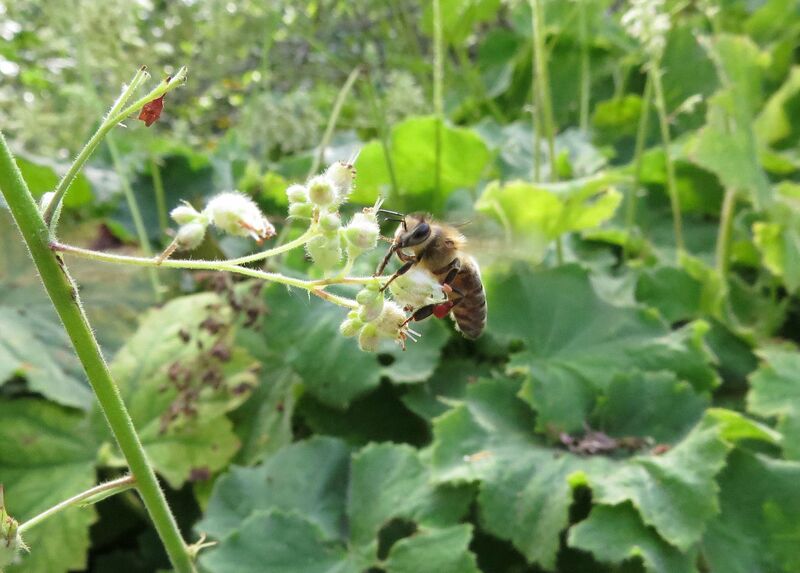 And of course now that they have a few honeybee hives on the property it's become far more apparent what native plants the bees really love. 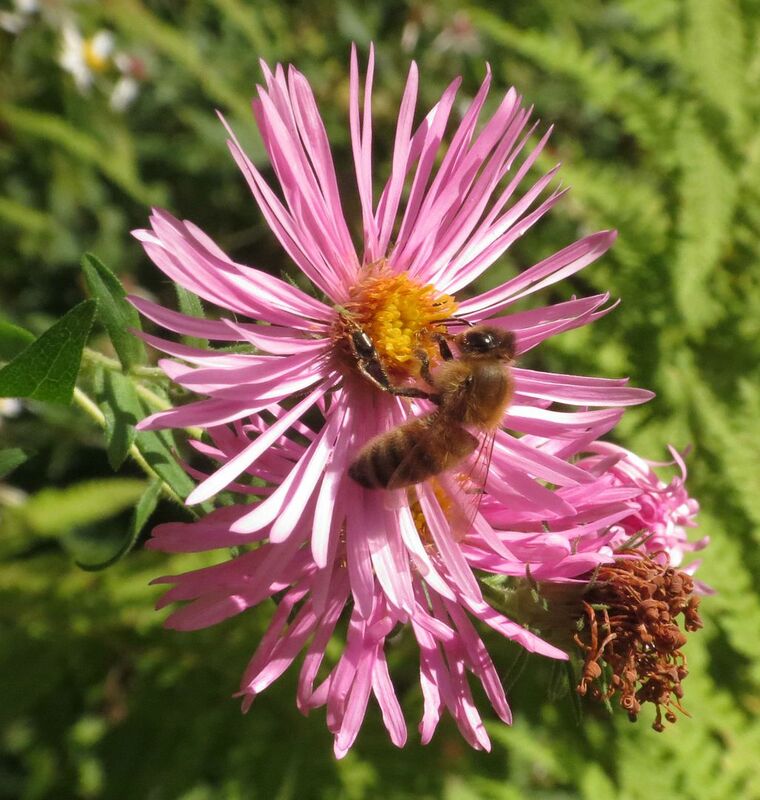 Now that Mountain Mint has finished blooming, I believe the winner of most perennial beds will be the common New England Aster, Symphyotrichum novae-angliae. 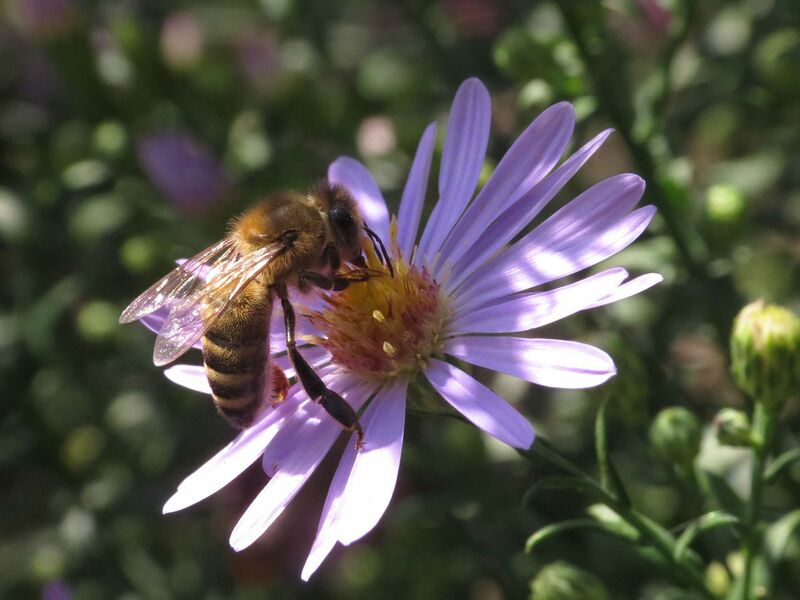 New England Asters come in a variety of colors but I've found the purple to be the most common. Pink, brilliant shades of Red, White and everything in between are also possible. Lost of cultivars are available on the market today and they're pretty easy grow by division or spreading seeds in pots of dirt outside over the winter. They can be slightly weedy but sometimes it's worth it to let them flower before pulling. A friend of mine had New England Asters take over his meadow garden but now he has every color in the rainbow. 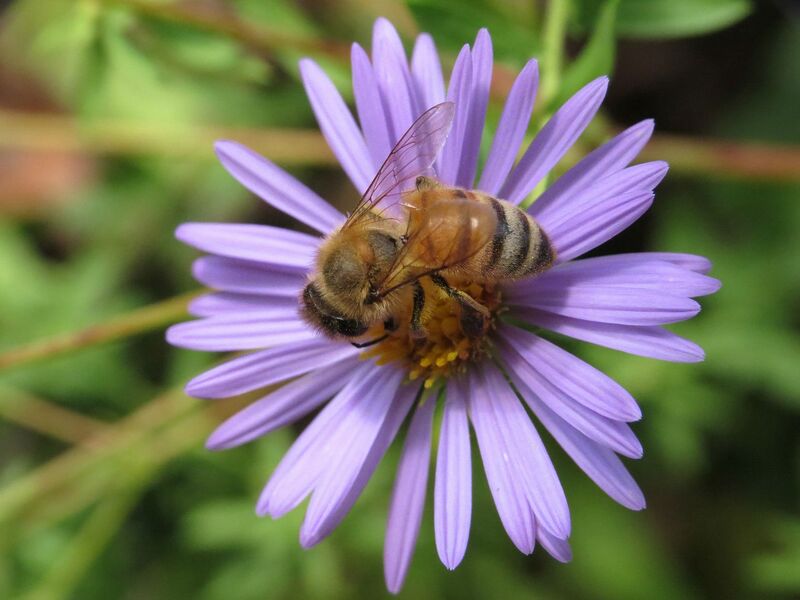 Symphyotrichum laeve 'Bluebird' is an up right perennial that grows more flowers than the true species. This is because it's actually a hybrid with another species, though I don't know the particulars on that. They look great if you can grow them. I've tried in the past and believe they benefit from regular watering, and or mulch, as opposed to testing out their drought tolerance. I don't believe this cultivar is prolific by seed, but they are pretty when grown beside other asters or goldenrod of similar height. 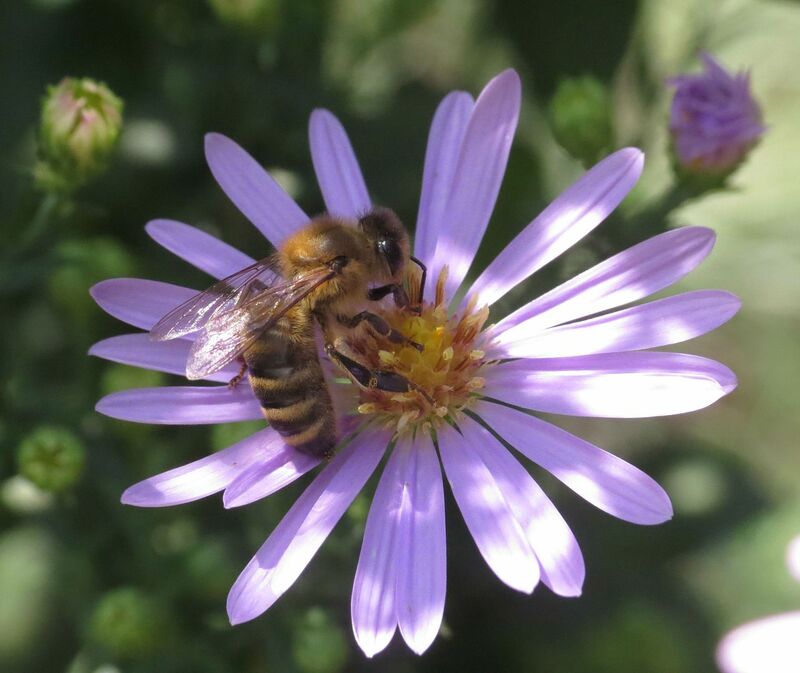 Aromatic Aster 'October Skies' is wonderful in mass plantings. A cultivar of Symphyotrichum olongifolium, this is a low growing aster which lays on the ground forming thick cloud-like pillows of flowers. Perfect at the edge of a flower bed or scattered among a meadow/garden of low plants. White Woodland Aster... actually I'm a little unclear what species this one in particular is. It's one of the lower growing species with masses of white blooms. 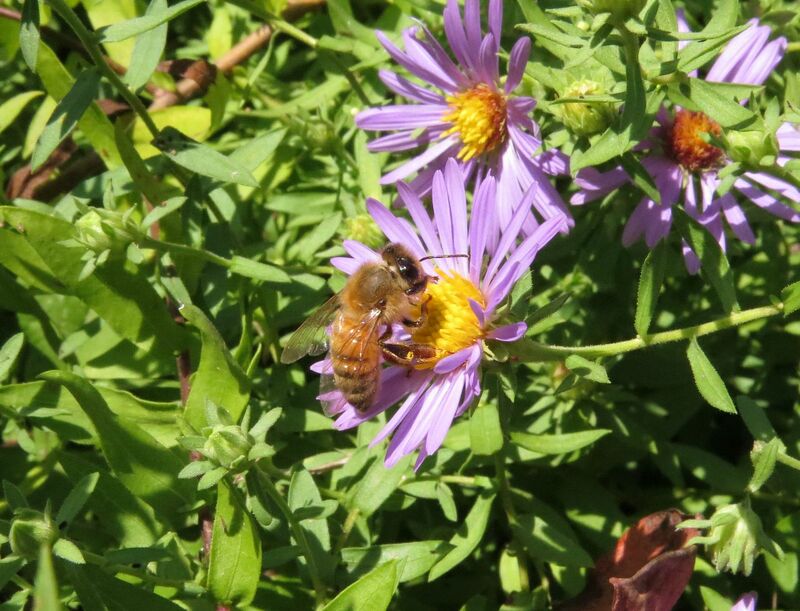 Oddly enough I have a species or two of these that come up wild in my yard and I only rarely see honeybees take a liking to them. At Mt. Cuba the clumps they had growing in the sparse woodland were getting a decent amount of attention. Not as much as any of the other asters but certainly more than anything else flowering in the woods. Vernonia angustifolia 'Plum Peachy' is a form of Narrow-leaf Ironweed with darker foliage and is more compact than the wild species. I believe it may also have flowers more evenly spread around it as opposed to just at the tips of stems but I could be confusing that with another the Mt. Cuba Center has/is working on. I didn't think to take photos of the foliage at the time but it has nice narrow leaves and looked similar to other cultivars of ironweed I'd seen in local nurseries. 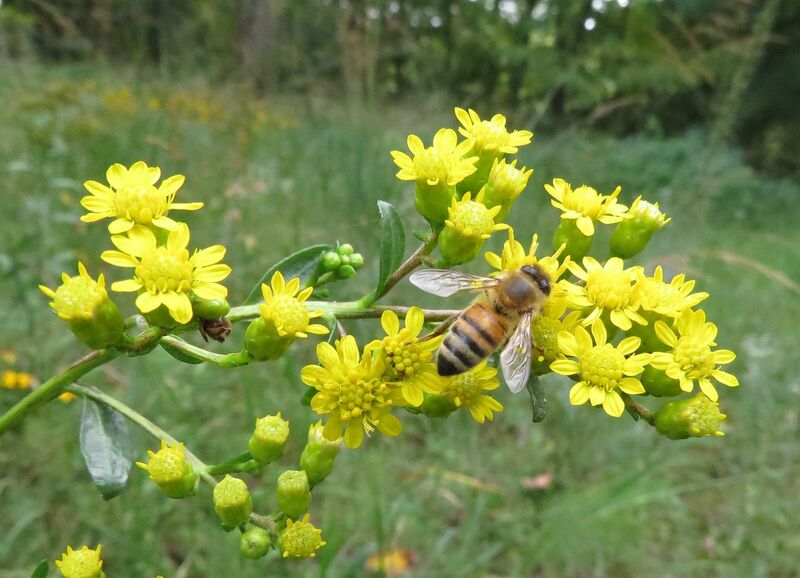 It was getting a decent amount of attention, slightly more so than the goldenrods growing around it but I know honeybees don't go nuts for goldenrod until after the peak Aster blooms. I'm planting three of these this fall and putting them right in next to my narrow-leaf Amsonia to see if they grow well at all. 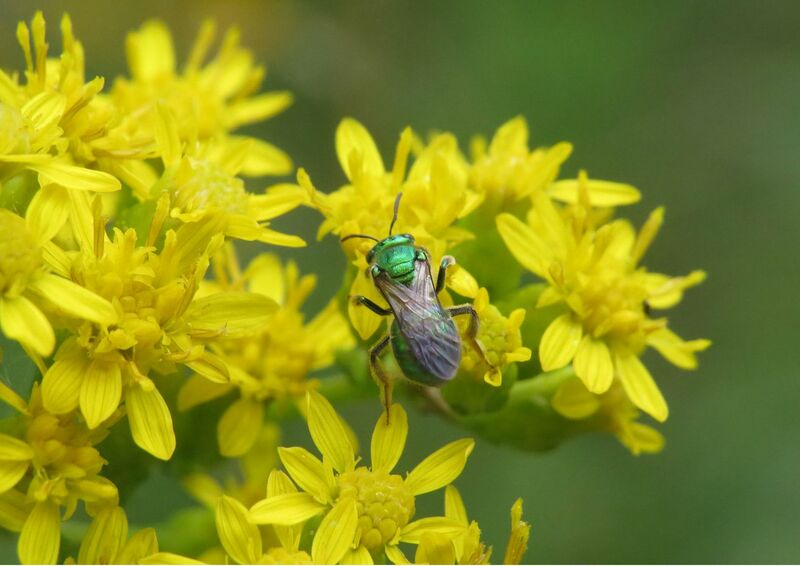 Stiff Goldenrod, Solidago rigida, was blooming well. This was the first time I've ever seen this species and I was taken by how big and fat the flower petals are which you usually don't even notice on Goldenrods. They had a patch of 50 or so plants, or at least that's about how many flowering stems there were. Just thought this was a good shot. Had the bee been posed a little better I'd go as far to say excellent. Noticed some spittle bugs on the stem. 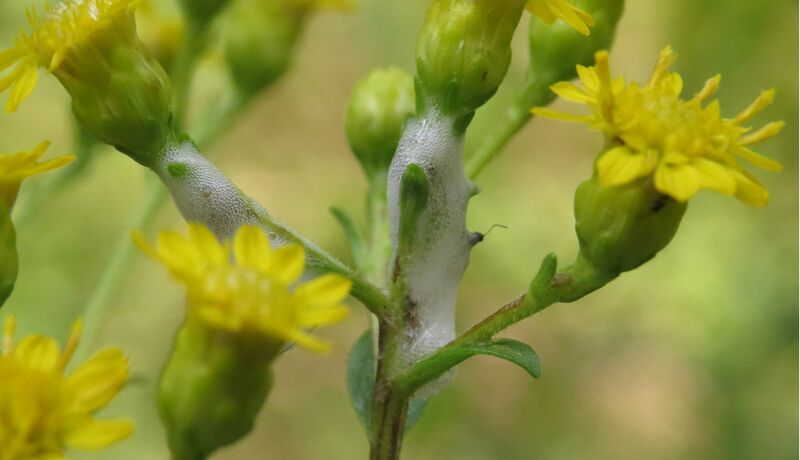 They produce a foam or "spit" to hide within while they feed on the plant much like an aphid. Solidago 'Fireworks' was also flowering, though not getting as much attention as I've seen it get in the past. 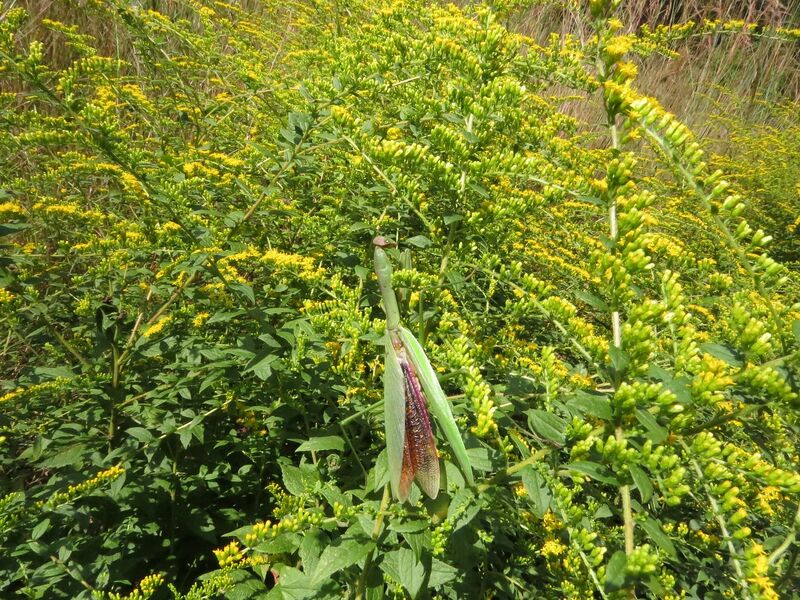 (The huge hungry mantis about to lay an egg casing might have something to do with that.) 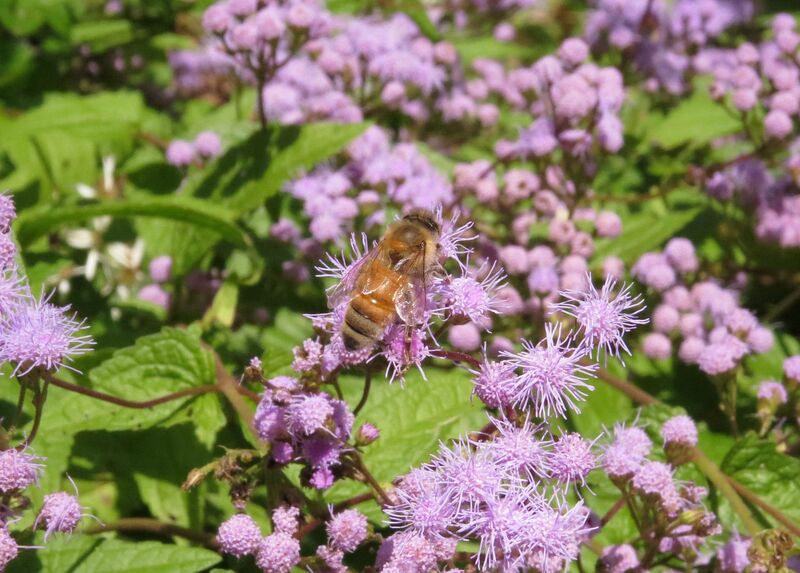 It's also not quite at its peak bloom yet and that's really when honeybees tend to take over such nectar sources. Obedient Plant is typically swarming with pollinators but I didn't find that to be the case that day. At least it wasn't for the patch that was next to the path. 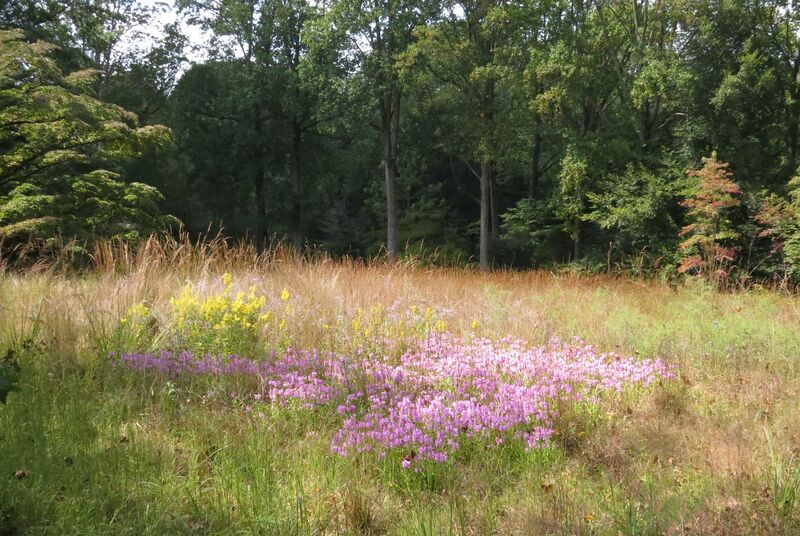 They also have it planted out in the meadow itself for a lovely pink effect but I didn't notice much flying around. Mistflower, Conoclinum coelestinum. I was slightly surprised to see honeybees on this one. First off I've never been able to get this species to grow in my yard. They have water requirements that are somewhat finicky; too wet and they don't survive the winter, too dry and they won't reproduce. I read they're ideally a shade plant and the more sunlight they receive the more moisture they require. The Mt. Cuba Center had them in full sun, at the bottom of a slope. 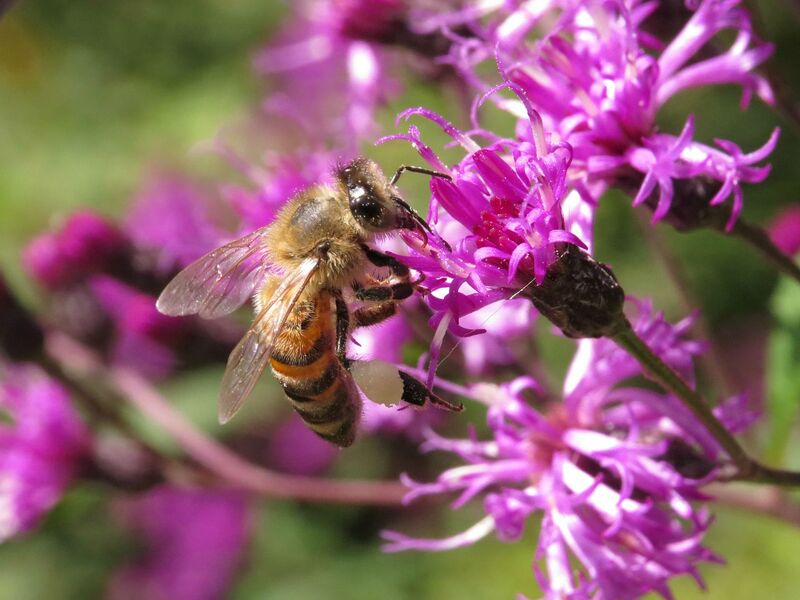 Honeybees use other plants that were formerly in the Eupatorium genus. Pretty much all of Joe Pye Weeds are a hit with them, but only some of the Boneset species. 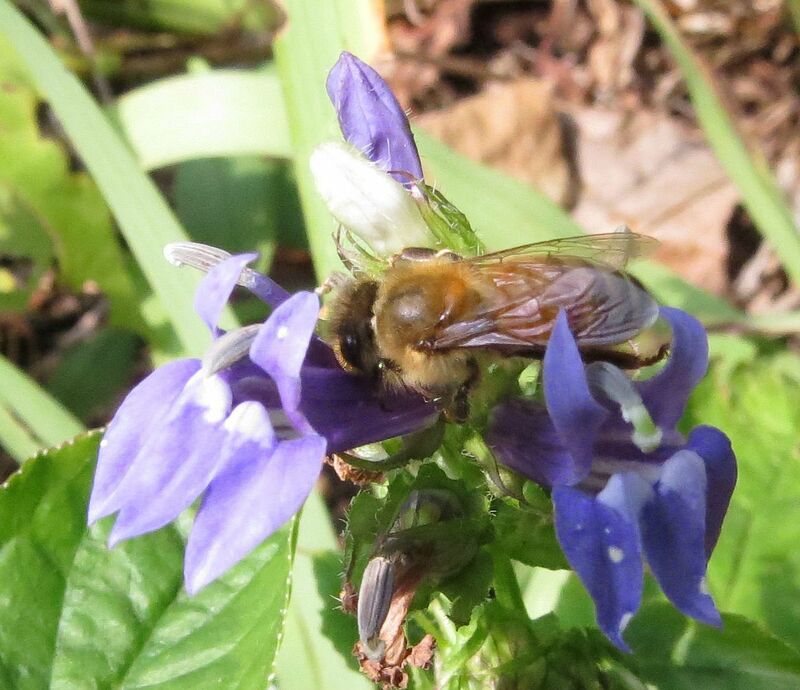 Our native Blue Lobelia, Lobelia siphilitica, is an upright, sometimes hard to establish and other times weedy perennial, with tube shaped pale blue flowers. I observe that while this is a wetland species, specamins growing closest to the water are among the shortest at around 2' at most while those growing farther away could reach up to 5' though 3 and a half certainly seemed more the norm. 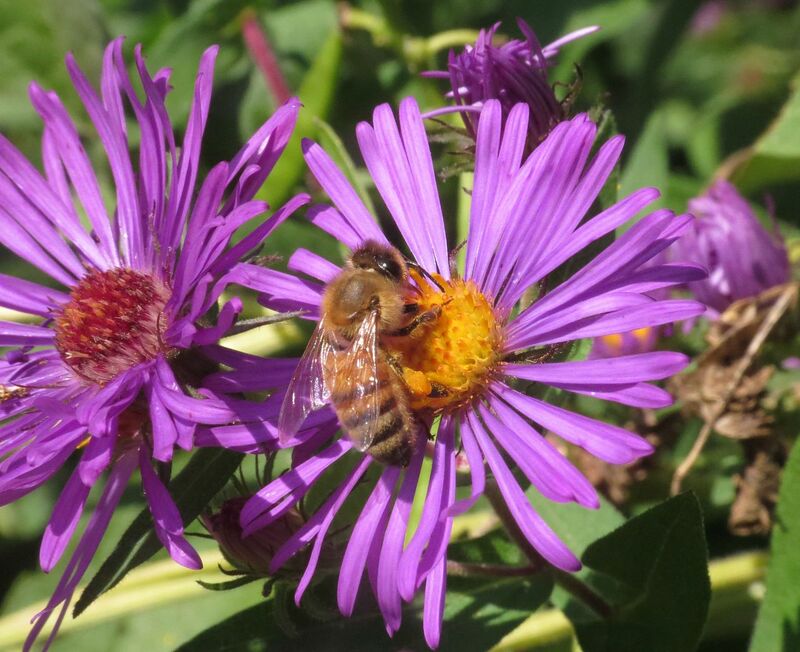 Honeybees are perfectly capable of working the flowers but I noticed none of them were bothering to do so. 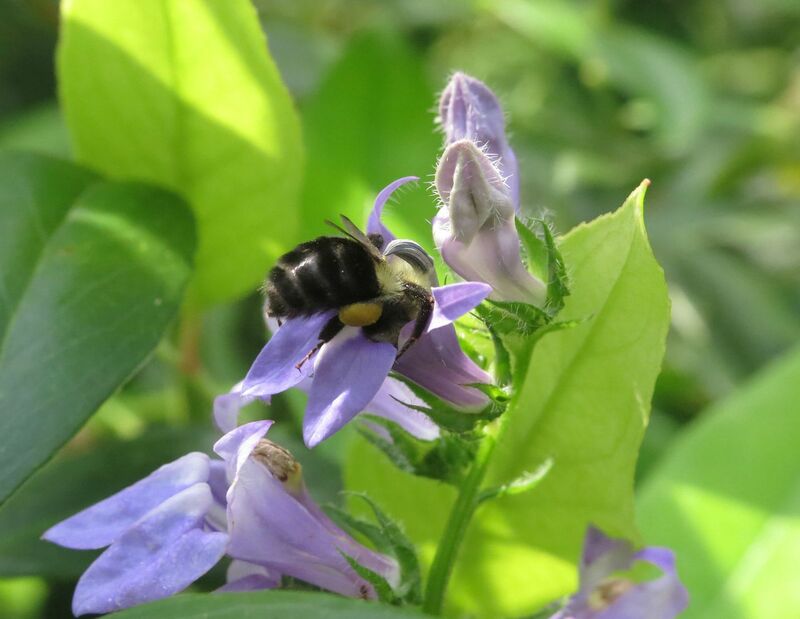 The only flowers they visited were ones which carpenter bees had already chewed holes in. 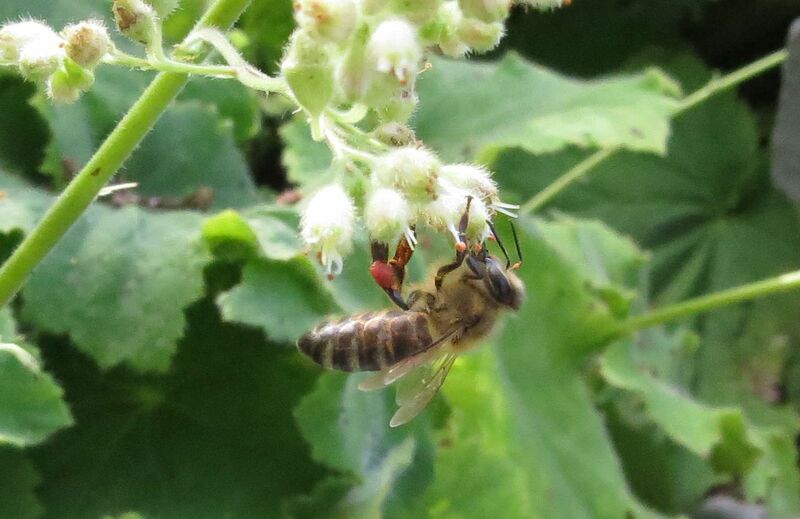 And lastly, I noticed honeybees working one of the Heucheras. 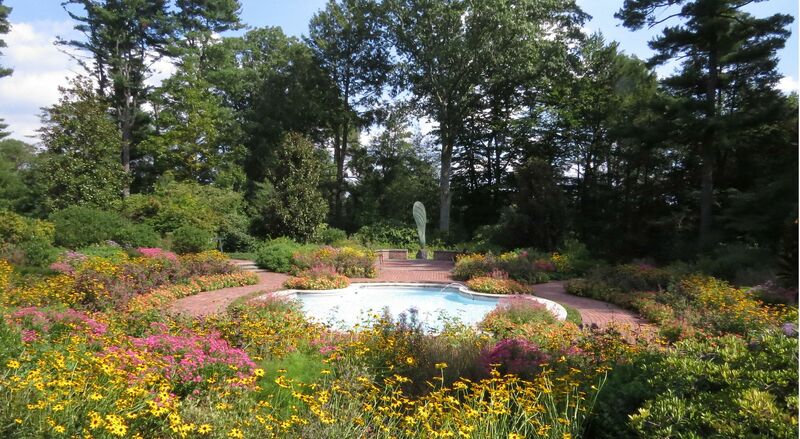 This is a genus of plants with hundreds of cultivars that offer every color imaginable. 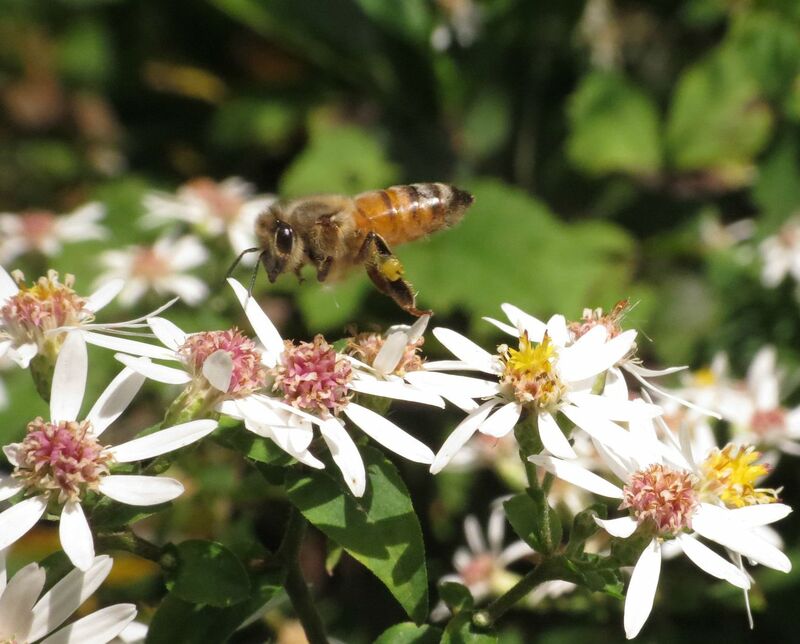 They're mostly pollinated by flies but a certain few, typically ones with larger (for the genus) white flowers are visited by bees. 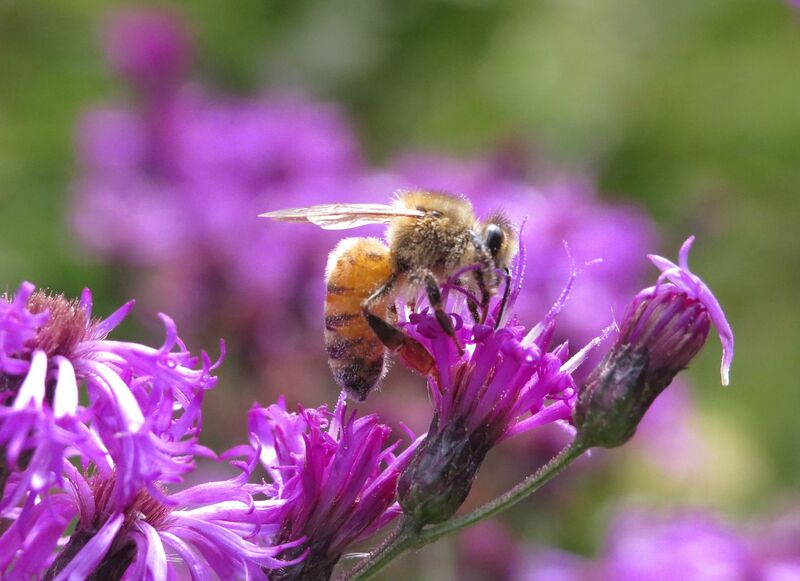 This particular species was mass planted near the Round Garden and the bees were gathering up nectar, and just look at that wonderful deep red pollen.